Micro computer control system automatically detects pressure while crimping. 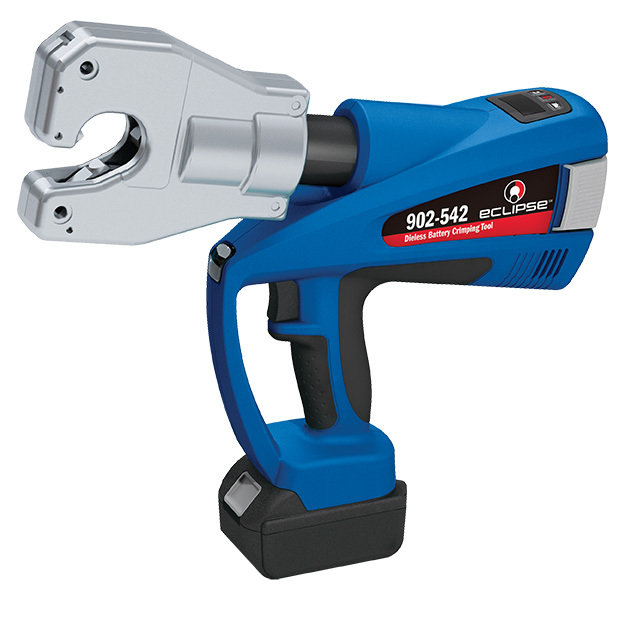 Pressure releases automatically - The tool will stop pressing and release 90% of its force when pressure reaches maximum value. The tool is equipped with a double piston pump which quickly makes contact to the material and then transitions to a slower, high pressure crimp. If a deviation from the set operation or a low battery charge is detected then an audible warning and red display flashes. Li-ion batteries do not have memory and will not self discharge. Even after long periods of non-operation the tool is always ready to operate. 50% more capacity and shorter charging cycles compared to NiMH batteries. A temperature sensor makes the tool stop working if it reaches 140 degreen ferenheit. It will return to normal working operation once the tool has cooled down.